Strengthens beard and gives deep nourishment while rejuvenating and providing natural shine. Our organic and cold-pressed oils help keep facial hair soft and reduce itching and flaking associated with beard growth. Includes a dropper to ensure you get consistent application each and every time. 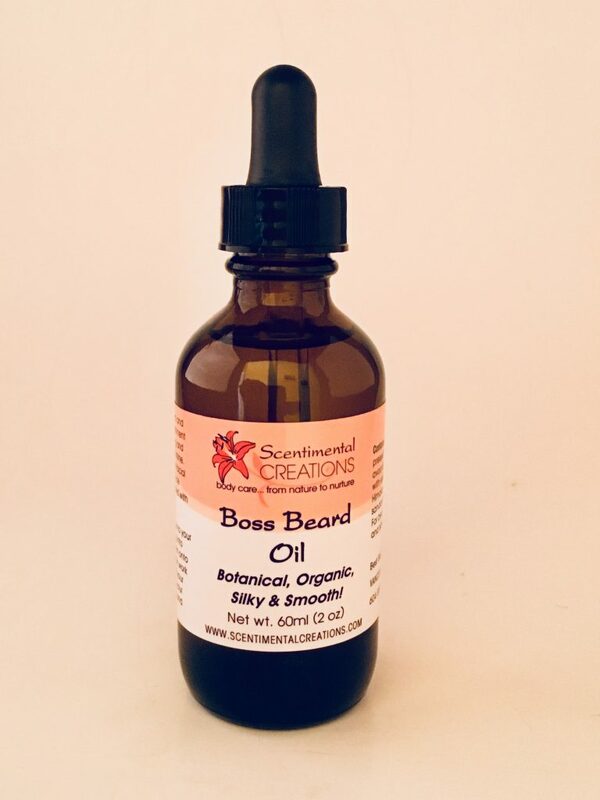 Simply work the beard oil into your hands, rub it into your face and beard, and now be a Boss! 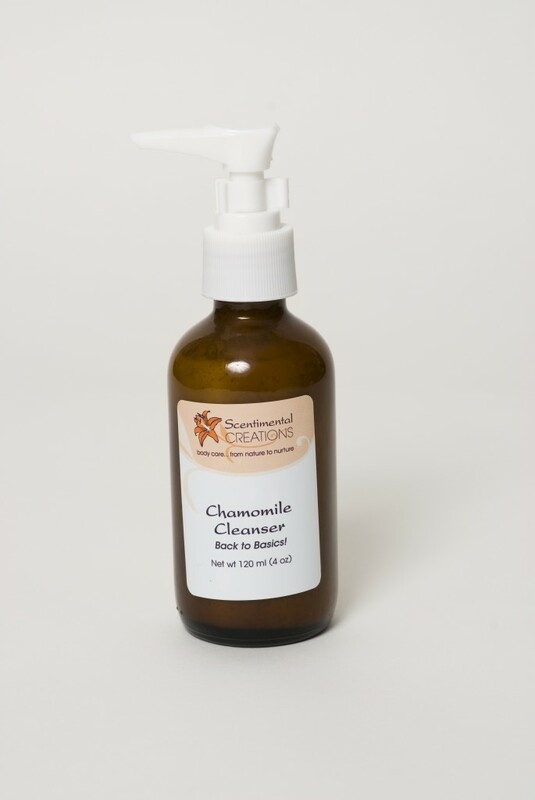 Contains organic oils of coconut, avocado, almond with essential oils of Himalayan cedarwood, sandlewood, and lemon. For beards, stash, stubble, and sidelocks! Natural protection with vitamin-rich and healing ingredients of beeswax, carnauba wax, shea butter, jojoba oil, castor oil, honey, titanium dioxide, zinc oxide, and vitamin E with essential oils of peppermint and spearmint. For effective and super nourishing lip balm, keep it “Plain” and simple or protect lips’ delicate skin from the sun’s rays with “SPF 15”. If you want to keep your lips soft, supple, sweet and kissable, our “Chocolate”version which contains real Callebaut chocolate or try our Coffee Lip Butter! Food for the skin! 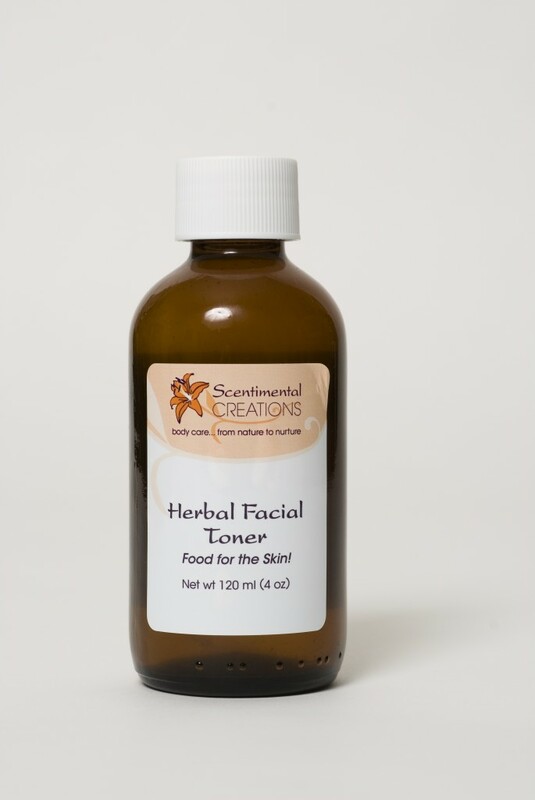 This herbal toner is an ultra-light hydrating liquid that increases skin moisture and smooths the skin’s surface while leaving a healthy glow. Contains aloe vera juice, herbal infusions, floral hydrosol, witch hazel and essential oils. A superb deep-cleanser that you only need to use once a week – and gentle enough to use as much as you wish! This unique combination of almond meal, orange peel, soy protein powder, aloe vera powder, organic colloidal oatmeal and essential oils stimulates your skin while dissolving any build-up overlooked by the daily routine. Our organic lip polish gently exfoliates and conditions, leaving lips incredibly soft and smooth. We have blended effective organic ingredients with sublime textures for a nourishing formula that offers soft, supple, and youthful-looking lips. Contains organic coconut oil, organic coconut sugar, shea butter oil and organic honey. Massage a small amount onto the lips. Rinse with a damp washcloth. Don’t worry if you lick your lips before you rinse – as it’s 100% edible! Can be used 2 to 3 times a week. Regain that radiant look! Nourish skin with our vitamin rich formula to improve elasticity, regulate oil production and stimulate circulation in any skin type. It is also remarkably effective for treatment of eczema, psoriasis, extreme dryness, irritation and other skin conditions. 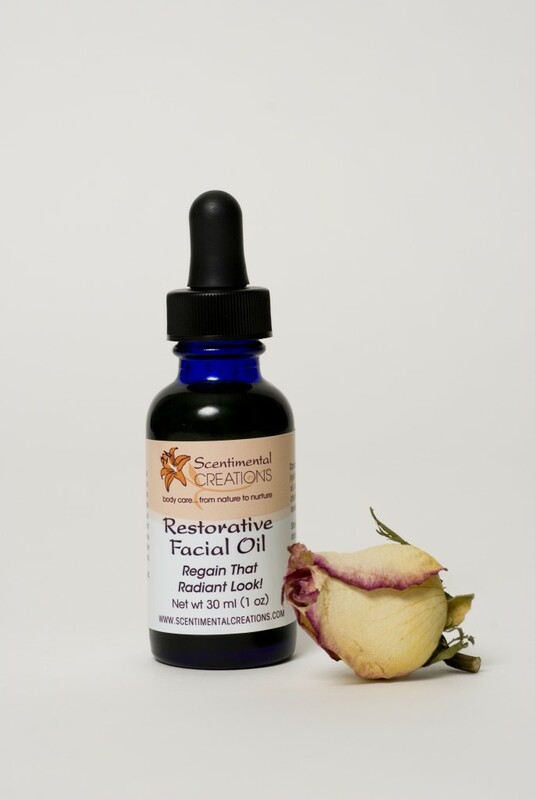 Our Restorative facial oil contains a superior blend of sweet almond, jojoba, and organic hemp oil along with essential oils of roman chamomile, carrot seed, frankincense, lavender and rose. This state-of-the-art serum provides a targeted blend of anti-oxidants and vitamins to fight free radicals and environmental stress. While moisturizing with fatty acid-packed plant oils and key ingredients, it smoothes fine lines with alpha lipoic acid and CoQ10. 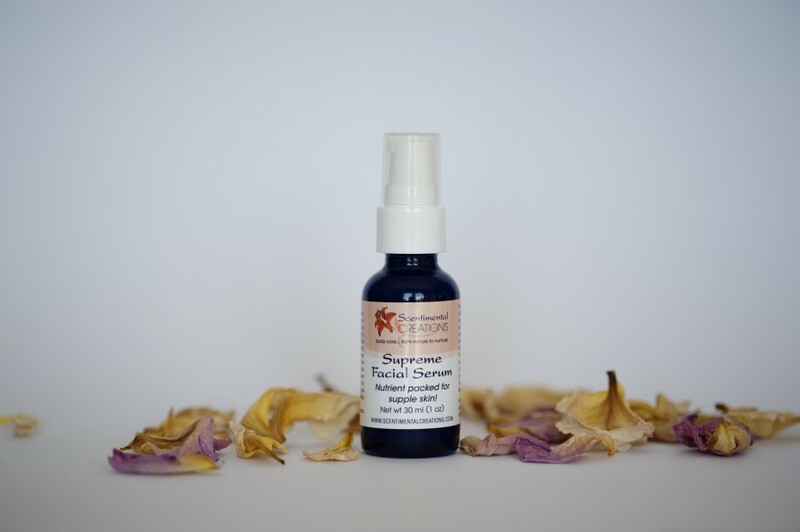 This nutrient packed serum is ideal for daily use to keep skin healthy and glowing. 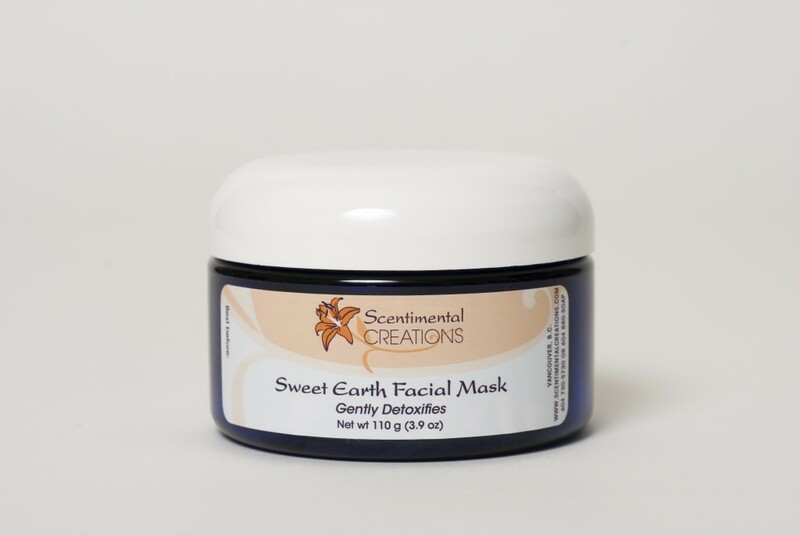 A combination of clays, the antiseptic and healing properties of this mask help control breakouts and regulate sebum production while facilitating healthier, clearer, hydrated skin. May also be used as a spot treatment for skin eruptions and acne-prone zones. Red rustic clay, french green clay, kaolin clay, aloe vera gel, organic honey, vegetable glycerin, vitamin E, green tea extract, grapefruit seed extract, red essential oils of rosewood and tea tree. A unique face and neck deep cleanser! 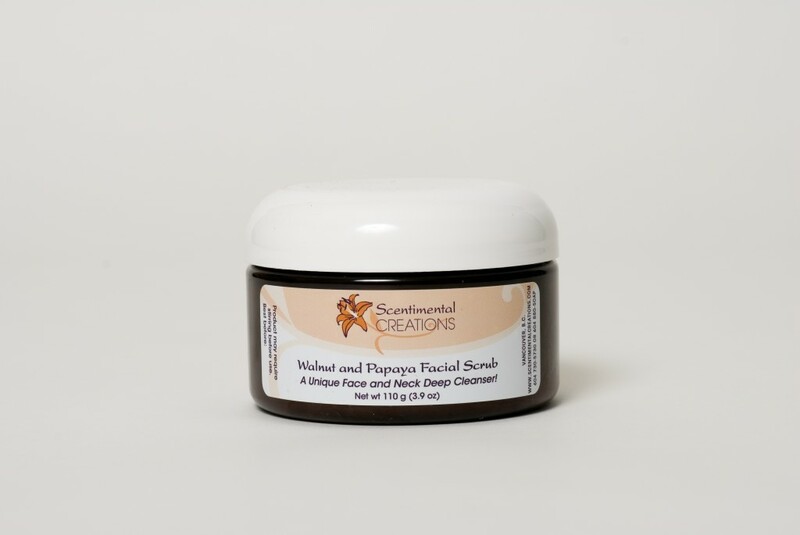 Nourishing botanicals soften and hydrate skin while fine walnut and papaya granules remove impurities and exfoliate. This gentle cleansing scrub will keep skin clear and slough away dead, dry skin cells. Contains vitamin rich oils and lecithin, along with aloe vera, soy wax, vegetable glycerin, papaya powder, sunflower oil, ground walnut shell, essential oils of clary sage, juniper, lavender and rosewood.